Ever come across a lemony flavoured spice used in mediterranean cookery? You may call it Persian red spice or lemon spice, but this lemony Mediterranean spice is actually powder of red berries of sumac plant. Sumac herb is name of flowering plant of genus Rhus. As against its cousin – poison ivy, Sumac is perfectly non poisonous. It is native to Mediterranean areas, especially in Sicily and southern Italy, and parts of the Middle East, notably Iran. What are different sumac varieties? The staghorn sumac is common variety of edible sumac herb. Smooth sumac (Rhus glabra) is another edible sumac species found in parts of US. There are some sumac varieties – like poison sumac – which are inedible. Staghorn sumac is easily identifiable with bright red velvety cone on tip of branches. In contrast, poison sumac would have cluster of white berries and roundish leaves. Sumac word originates from “sumaga”, meaning red in Syriac. What are sumac berries? Fruits of sumac plant form dense clusters of reddish berries, which are also called as sumac bobs. Individual sumac berries are small and around centimeter diameter with hairy texture. What is sumac spice? Sumac spice is actually powder of dried sumac berries. When ground, sumac powder looks very much like paprika, but offers amazing tangy punch. Sumac spice powder is often mixed with salt. Sumac is also known by other names like: Elm-leafed Sumac; gewürzsumach (German); kankrasing (Sumac in Hindi); shumac; Sicilian sumac; somagh (Farsi); sommacco (Italian); soumaki (Greek); sumac (French); sumac, Somak (Turkish); sumaq (Hebrew); summaq (Arabic); zumaque (Spanish). Sumac berries contain mainly water soluble extract containing Vitamin C and other vitamins, protein, fiber and Minerals like potassium, calcium, magnesium, phosphorus. Nearly 4% of sumac by weight includes tannins. Its tangy flavor is result of high acid content and because of malic acid, gallic acid, citric acid, fumaric acid and ascorbic acid present in berries. Potassium, Calcium, Magnesium, and Phosphorous are minerals found in good amounts in Sumac berries. Sumac Leaves – Infusion of sumac leaves is used for treating asthama, diarrhea and stomach disorders. A poultice of sumac leaves is used to treat skin rash, sore gums and sore lips. Sumac – a superfood? Sumac is full of Vitamin C and other phytochemcials which are strong antioxidant in nature. They help ward of free radicals in body and thus protect body from degenerative diseases including cardiovascular diseases, stroke and diabetes. Results of lab studies confirm strong antioxidant properties of various parts of sumac. Sumac can potentially be used in treating hypertension and degenerative cardiac disorders. Anti inflammatory properties of Sumac – Inflammation in body results many disorders including fever, arthritis, skin inflammation, respiratory disorders, bronchitis and others. Lab results confirm that sumac and its extract have good anti-inflammatory properties. It is helpful in treating common cold, flue, arthritis and other inflammatory disorders. Skin protective properties of sumac – With its anti-inflammatory and antimicrobial properties, sumac is helpful in treating skin problems and heals wounds. Chewed sumac leaves can be applied to skin rashes, inflamed gums and sore lips. Sumak protects heart and liver – High cholesterol is common reason for heart and liver disorders. Lab based studies on rats suggest that sumac berries extract reduces blood cholesterol levels . This is beneficial for protection heart and liver in case of high cholesterol. Rhus for diabetes – Research further suggests that sumac is effective in case hyperglycemia, diabetes and obesity. Lab results have shown that sumac with its strong antioxidant properties help reduce blood sugar and cholesterol levels. Sumac health benefits – Diuretic : Sumac berries have diuretic properties. It aids in production of urine and helps in excretion of toxic materials from the body. It is used to cure inflammation of the bladder and painful urination. It is often used in bowel complaints. In Middle East, sour Sumac juice is used to relieve stomach upset. Sumac berries are chewed as traditional remedy for bed wetting. Anticancer properties – Some research is also carried on its anti tumour properties. In one study, edible staghorn sumac fruit extract, used along with chemotherapeutic drug, treated breast cancer cells while no effects on other healthy cells. Thus Sumac extract was considered promising chemotherapeutic drug conjugate in cancer chemotherapy. Sumac benefits for women – Traditionally infusion of sumac bark/rooks or sumac tea is used as cure for women disorders. Sumac is externally applied in case of excessive vaginal discharge. It helps in increasing secretion of breast milk. It has estrogen like behavior and helps in treating menstrual disorder, menstrual cramps. To summarize, health benefits of sumac can be mainly attributed to its anti microbial, antioxidant and anti-inflammatory properties. Are sumac berries edible? Yes, sumac berries are perfectly edible. They taste tangy lemony in flavor. Shoots of smooth sumac are edible and were used by native Indians in salads. Young shoots are peeled and inside white core can be eaten raw. It has strong aroma, perfume-ish and astringent taste. Sumac is used to make tangy cool drink known as sumac-ade or Indian lemonade or rhus juice. Sumacade is made by soaking sumac drupes in cool water, recovering extract and adding sweetner. Quallah is juice made by Cherokee Indians from sumac berries. Sumac berries are soaked in hot water overnight and later stained to get quallah. 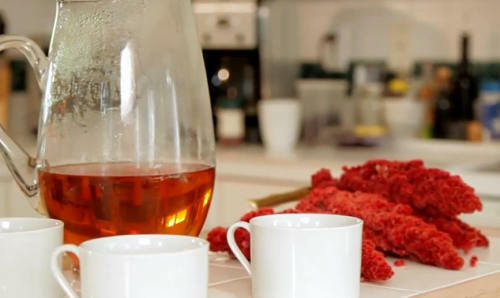 Sumac Tea – is seasonal herbal tea made from sumac berries. Freshly harvested sumac berries steeped in hot water overnight results in pink coloured herbal tea. Tangy sumac tea offers good way of utilizing its health benefits for improving heart, kidney and liver functions. Native Americans mixed Sumac leaves and drupes along with tobacco in their smoking mixtures. Dried Sumac spice is widely used as condiment in cooking. Sumac fish is popular recipe of grilled fish marinated with sumac spice powder. Sumac spice forms key ingredient in Persian cooking. Ground sumac spice blends well with vegetables, meat, chicken and fish. It is used as souring agent in topping for making fattosh salad and hummus dips. In Iran, sumac is added to rice or kebab. Turkish döner kebab are incomplete without sumac. Popular Jordanian spice mixture za’atar contains sumac along with sesame and thyme. Similarly Lebanese cuisine employs sumac effectively. Sumac juice is used for salad dressings and marinades. The sumac seeds contain oil which is used to make candle wax. How to make sumac spice powder – Wash and sun dry red sumac cones. Once dry rub to remove dry berries. Allow them to dry further. Coarsely grind such that seeds inside do not blend. Seive out seeds and discard. Grind remaining sumac bran to coarse powder. Dry roast the mixture and store in air tight container. Can I buy at a health food store. And help with my inflammation. I foraged 10 Sumac flower head. It is free, just keep your eyes pilled for the striking red flower(it is easy to identify it with some key identification), it is very distinct. I made a tea this morning, taste pretty good! I don’t know if you can buy it at a health store but you can likely find it growing in the wild. I have lived in Virginia and Colorado and have seen it many times in both states and states in between. The berry heads are dark red and upright clusters. You can just pick a few and place them in cold water to sit for a few days and make your own for free. Please reference a field guide or look at more pics online to be sure you are picking the right plant. I just made some sumac aid today and am enjoying for the first time. It is very lemony and I like to drink it hot with a little honey. Here in Albuquerque, NM, we found Ziyad brand at our favorite international market. You can find it in Middle Eastern store. Know three people that wound up in a hospital emergency room after coming in contact with one of the red sumacs (smooth or staghorn – in these instances). Anyone that is extremely allergic to any members of the Anacardiaceae Family (poison ivy, poison oak, poison sumac, smooth sumac, staghorn sumac, winged sumac, cashew, mango, pistachio, etc.) needs to stay away from the “safe” red sumacs. There are lots of websites (including this one), plus books and magazine articles that say sumac is high in Vitamin C. Where is the scientific proof from laboratory studies? HUMMUS SANDWICHES, I make homemade hummus for sandwiches and I sprinkle safe red sumac on top of the hummus.